When Father Monroe discovers that Marcela and her Cuban-American family are struggling, he offers a warmth and kindness unlike anything Marcela has ever experienced. Small acts of generosity blossom into love as the lines between vocation and passion begin to blur. Artistic Director Emily Mann and playwright Nilo Cruz reunite for the first time since the Pulitzer Prize-winning Anna in the Tropics with this lyrical new play about falling in love and finding a place to call home. Visit the Bathing in Moonlight website for information about the cast and creative team, play synopsis, character profiles, special events and packages, and more! 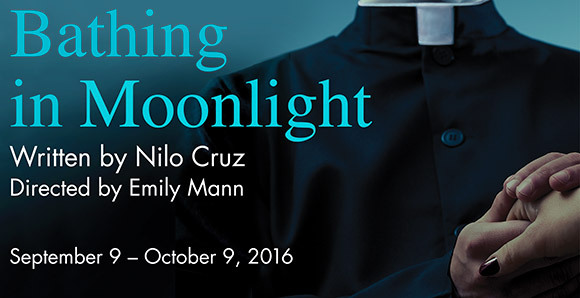 Join us out in the community at the Princeton Public Library for a moderated discussion with Nilo Cruz and Emily Mann about their artistic partnership in bringing Cruz’s lyrical new play Bathing in Moonlight to the stage.